If you like shredded bbq beef sandwiches, this recipe for smokey bbq chuck roast is what you need. You could spend all day smoking it until it's tender...or you can take the smoker-to-oven shortcut and have your sandwiches in half the time! Beef chuck is from the shoulder area of the steer. It lies behind the neck and in front of the rib section. Various parts of the chuck range from tender enough to grill, to being tough, requiring braising or low-and-slow smoking to tenderize. Best bets for this bbq beef recipe would be the top blade roast, the under blade roast, and the chuck eye roast. These will take less cooking time than other chuck cuts when using the smoker/oven cooking combination. To prepare the roast, remove excess fat (not all of it, just the large deposits) and cut the roast into 3 or 4 even size pieces. 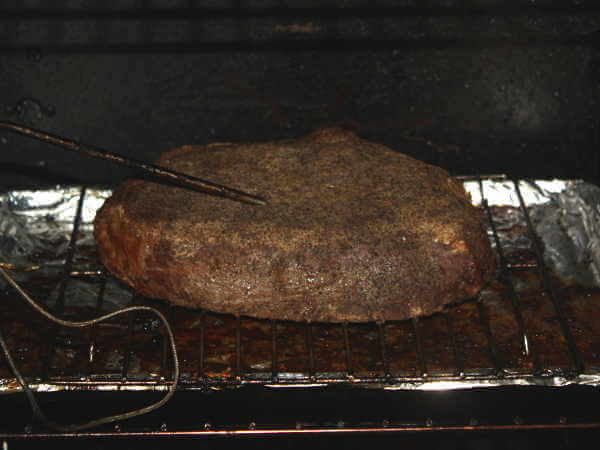 Doing that exposes more surface area to smoke, and also keeps more of the meat in the juices as it bakes in the oven. Combine the rub ingredients. Season the pieces of chuck on all sides with the dry rub and place into the pan. Preheat your smoker to 225-250 degrees Fahrenheit, and add the smoke wood (a combination of oak and hickory adds a nice flavor). When the smoke starts to roll, place the pan of meat in the smoker. After one hour, turn the meat over and add a bit more smoke wood. Continue smoking for another hour, then remove the pan from the smoker, flipping the meat one more time. Cover the pan with foil and place it into a 300 degree oven. Bake for another 2 to 3 hours, or until the meat is tender enough to shred. Remove the pan from the oven and allow the meat to cool a bit in its juices. Place the meat on a cutting board. Pour the juices into a Pyrex measuring cup or a fat separator, then discard the fat. Remove any remaining fat and gristle from the meat, then shred it using a pair of forks...or your fingers. In a bowl, combine the shredded meat with 1/2 cup of the meat juices and 1 cup of your favorite sweet, red bbq sauce. 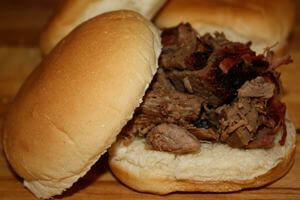 Smoked, oven baked chuck roast makes some of the best bbq beef sandwiches around. Piled high on white buns or bread, be sure to top the meat with a generous dribble of Louisiana hot sauce and a few dill pickle slices. You just can't beat eating like this!